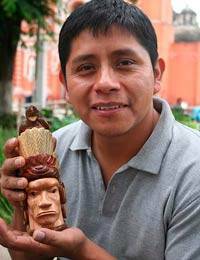 Nature inspires Diego Mendoza as he reclaims roots from the hormigo tree, letting the wood itself dictate the shape of each carving. Sculpted into a sugar bowl, this delightful design depicts an hormigo wood coffee bean on the lid. A hand carved spoon completes the set. 'Coffee is one of the most representative crops of Guatemala. I designed this sugar bowl to accompany your coffee pot,' the artisan says.